I may have been looking forward to revisiting food blogs since April (Food Blogs, Volume 1) or even when I reviewed beer, wine and spirits blogs in June. Or coffee. Or cheese and fine dining. 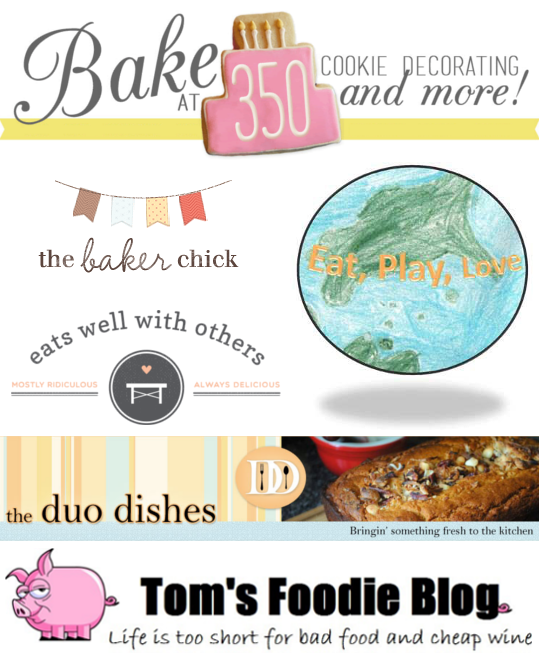 Bake at 350 is the blog of baker and author Bridget Edwards. As such, this is a fun blog, and the photography is amazing (if I could just figure out how to get a fork through the computer screen). Some of my favorite posts (there were several) include Biscoff Coffee Cake with Biscoff Crumb Topping, Cake Batter Blondie Bars, and Pumpkin Cheesecake Brownies. If you want to follow Edwards, I recommend starting with her Pinterest page. Or, follow @bakeat350tweets on Twitter. Blogger Joanne Bruno started the blog in 2009, while a senior in college as a way to teach herself how to cook. Honestly, her Moroccan chickpea and butternut squash soup is probably one of the tastiest bowls of fall soup I’ve laid eyes on. Also: Curried root vegetable pot pies and rigatoni with spicy pumpkin cream sauce. Blogger Tom Holmberg covers a lot of information on his blog, from restaurant reviews to food trends. Because it’s almost Thanksgiving, a post that caught my eye was Top 15 Alternate Ways Turkey Recipes, which covers everything from smoked turkey to turducken. I appreciated Holmberg’s recent featured post: Hidden Orange County Wine Loop – Napa Valley, Eat Your Hvarti Out! Some other posts that I enjoyed include Top Produce Trends from PMA Fresh Summit 2014, Best Las Vegas Buffet Bacchanal or Wicked Spoon? and Top 10 Cookie Recipe Hacks. The Baker Chick honestly had me at cheesy cauliflower gratin with bacon. I mean, seriously. Blogger Audra Fullerton moved from the Midwest to New York to pursue her dream of performing on stage. After five years of acting and doing what she loved, Fullerton pursued another life passion: Baking and cooking. The Baker Chick is a great site. I could honestly spend hours here, pouring through recipes like peanut butter banana cream pie, ginger vanilla bean ice cream sandwiches, cranberry swirl mini cheesecakes, and buttermilk spice layer cake with brown sugar cream cheese frosting. Eat, Play, Love chronicles the family and kitchen adventures of a Midwest family of four. I especially love how involved and hands-on her children are in preparing meals. Other posts I enjoyed include A Busy Kitchen (Ok, kitten Hobbs – adorable), Harvesting the Last Days of Summer, and Country Magic. The Duo Dishes is a Southern California blog that experiments with blending family tradition, regional fare, and new ethnic flavors. It’s written and managed by freelance culinary consultant and writer Chrystal Baker, who covers recipes, restaurants, and food events. Some pretty great posts that caught my eye include Saffron Split Pea, Potato and Bacon Soup, Sharing The Art of Tea, and Making Macarons with a Pro. P.S. Ever wonder how we come up with ideas for our blog profiles? Our handy list of industries and subjects on PR Newswire for Journalists stays top of mind. If you’re a blogger or journalist looking for food and beverage or restaurant news, let us know. We’re happy to customize that feed for you on PR Newswire for Journalists. Christine Cube is a media relations manager with PR Newswire and freelance writer. She woke up early to hit the farmer’s market for the cinnamon rolls. THE cinnamon rolls. Follow her @cpcube.